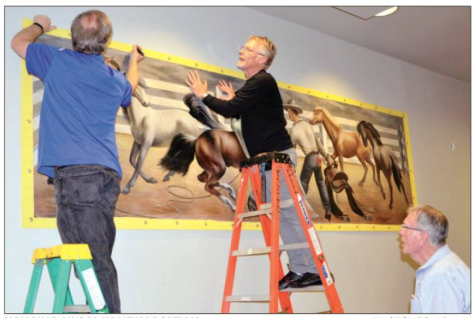 Fletcher Martin’s 1939 mural The Horse Breakers was cleaned, restored and renewed at Fine Art Conservation Laboratories in Santa Barbara California and Scott M. Haskins, conservator, accompanied it on its return to Lamesa Texas where it was recently hung in the new Lamar Forrest Park Community Center building. http://www.pressreporter.com/Content/News/Front-Page/Article/Restored-mural-is-back-in-Lamesa/1/11/3646 Local resident Randy Leonard and a grant from the Weaver Foundation paid for the conservation of this historic Great Depression mural. http://www.ci.lamesa.tx.us/index.aspx?NID=164 Community Center in Lamesa. W. K. Gordon Center for Industrial History of Texas at 65258 IH-20 Mingus Texas, formerly Thurber that is now a ghost town, is operated by Tarleton State University at Stephenville. The Center is east of Ranger Texas and west of Weatherford Texas astride Interstate Highway 20. It recalls a former coal mining and manufacturing episode in the state’s history. https://en.wikipedia.org/wiki/Thurber,_Texas and is culturally and historically significant. Texas Tech baseball team won the Big XII Conference championship with a record of 38-13 and 17-4 in conference. Hopefully the Raiders will play into the College World Series. Texas Tech men’s tennis team, ranked eighth in the nation and host of a NCAA Championship tournament regional event at Lubbock, lost to # 30 ranked Southern Methodist University 4-2 and will not go to the national NCAA Championship tourney. The Mustangs will meet # 9 ranked Florida at the national tourney on Friday May 20. The season-ending ranking of eight in the nation is the highest ever achieved by a Texas Tech tennis team and the players and coach deserve congratulations despite a faltering in the post-season closing tournament. Willie’s latest album is Summertime: Willie Nelson Sings Gershwin (Legacy Recordings 2016) $12. Earlier Willie received the Gershwin Prize from the Library of Congress and that impelled him to cover some George and Ira Gershwin songs. Willie and his Family Band along with other singular and well-known entertainers are on the 4th of July 2016 Picnic Stage at Circuit of the Americas automobile racetrack southeast of Austin. http://www.circuitoftheamericas.com/willie $300 will get you two standing room only general admission Pit tickets plus a parking spot for your vehicle. We are so spoiled by living in a low dollar off the main tour location. I remember sitting about 70 feet from Willie while he performed at Lone Star Amphitheater overlooking Yellowhouse Canyon south of East Broadway Street in Lubbock. If memory serves the admission ticket was something like $22. On Saturday May 21 while Texas Tech students are going through Commencement, David Shea will teach a class 2:00 – 4:00 pm on Taming the Wild Elephant Mind, a Buddhist teaching, at Highway 108 store at 4410 50th Street just west of Quaker Avenue on the north side of 50th Street. You can pay the admission price $20 at the door. Quality art is widely available in Lubbock but if you are new to the scene, there is no better place to start than Charles Adams Gallery downtown at 602 Avenue J http://www.charlesadamsgallery.com Charles is perhaps the best connected most knowledgeable gallery operator and art dealer in the area. He is also trustworthy.